The Monster Energy Outbreak Tour is coming out of the gates strong in 2019. The prestigious touring brand just named multi-talented rapper, singer and songwriter, A Boogie wit da Hoodie, as the headliner for their upcoming winter and spring tour. 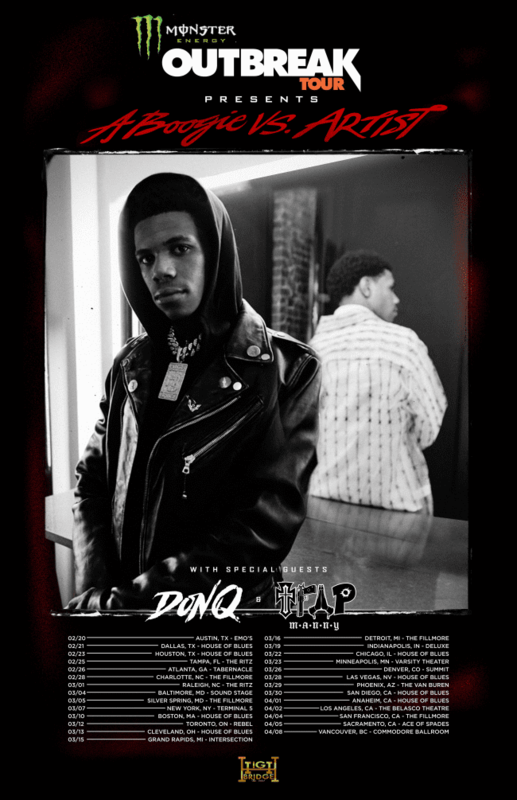 The tour kicks off February 20 in Austin, TX and will make stops in Los Angeles, New York, Chicago, San Francisco, Atlanta and other major cities across the U.S.
Bronx native Artist Dubose, aka A Boogie, rose to stardom when his major label debut, The Bigger Artist, reached #1 on Billboard’s Emerging Artists chart and cracked the top 5 of the Billboard Top 200. Named by The New York Times as “the most promising young rapper the city has produced in some time,” and nominated by BET for 2018’s Best New Artist award, A Boogie is poised to prove that his accolades are well-deserved in 2019.